Reader Christine, has a terrific little suggestion for staying on top of paperwork. A traditional tickler file didn’t work for her, so she found a system that did. After learning about her process, I asked if i could share her message to us in the form of a post. Thank you, Christine, for sharing your tip with us! Like most people, I am constantly battling the paper monster. Though I am making strides in going digital, I had been struggling on how to organize the things I still receive as hard copies. Inevitably, there are things that need to be filed, paid, or acted upon in some way at some time that does not exactly coincide with the moment I first touch them. For me, letter sorters didn’t work — the papers would end up avalanching all over the place or would be sorted incorrectly. I had tried and failed to use a “to do” file folder; I personally benefit from visible reminders and would easily forget about them when I filed the papers. After seeing small binder clips with “to do” and other similar words printed on them, I was inspired to create my own using regular large binder clips and a label maker. I printed labels on my label maker that read “To Do,” “To File,” and “To Pay,” placed them on the binder clips, and hung the clips on sleek aluminum pushpins on the inside of my coat closet door. The papers are out of sight when I want them to be, but serve as a visual reminder for all my “to dos” each time I open my closet door. The size of the clip also creates a limit to how long I can put off the inevitable. This idea can be applied in various ways, of course. I can see it working on a bulletin board or wall in a home office, or inside of kitchen cabinets. (These colorful magnetic spring clips could be substituted on a chalk board or other magnetic surface.) You might want to have one by the front door for papers you must bring with you when you travel. This would also be a good way to organize kids’ homework or household information you need to frequently access (for that application, I could see laminated sheets on a ring, with the clips as identifiers). You could also use color-coding — either painting them yourself on regular black binder clips or by purchasing clips in various colors. 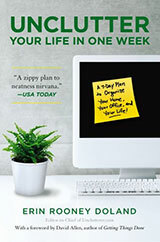 No matter where, why, or how, it’s a cheap and easy idea that can help you be a little less paper-crazed. This idea works well, especially if you like to have your papers out in full view. That way, I can clip the items together and file them in folders like regular paper but still clearly see what they are when I pull the file drawer open. I also use them that way for papers I plan to store on my desk in an upright position like books on a bookshelf. The binded papers stand up straight and are easily identified with a glance. Whenever someone gives me one of those spiral bound proposals that can’t be identified by any writing on the “spine,” I label them with a binder this way so I can find them among the books. This trick works for all sorts of items and on all sizes of binder clips, even the wee, itty bitty ones…provided you have good enough vision to read the tiny print! I keep my photo album stuff (sleeves of clear plastic in several different layouts – 3×5, 4×6, etc) and my filofax inserts (pocket sized calendar pages, etc) in file folders. They are clipped together by category and easily recognized by the label on the binder clips. I don’t lose small pieces to the depths of the file and nothing sneaks out the sides of the file folders into the depths of the file cabinet itself. The binders are even good for single sheets of paper that I use often enough to want to label them. I have a lot of bank stuff in one folder labeled “bank Stuff” but the one piece of paper I use regularly is a list of regular monthly expenses on one sheet of paper. I put a medium sized binder clip on the page, labeled it, and stuffed the page among the others in the folder. When I want it, I don’t have to remove the file from the cabinet and go through the loose pages to find it; I just look at the file folder and pull the binded page out. But I am going to try labeling the “front” of some clips to keep on my front door. It’s made of metal so some magnets and some binder clips will hold the stuff the kids’ need to take to school every morning and the things I need to mail, etc. I had been using magnetic bins but the binder clips will look better. What a great idea! I’m on my way to work in about 5 minutes and I’m going to put this one into practice immediately. I can just see how it would work and my desk will be all the better for it. I keep my stuff organized, but during the day, for various reasons, it becomes askew and disarrayed. This will work wonders! Thank you a million. I love this idea: smart, inexpensive, and easy. Thank you for it. Keep up the good work. Here is a similar idea for families of school-aged children. 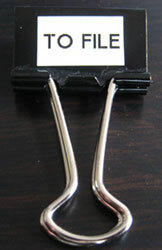 Pendaflex’s Label Smart Binder Clips come in multi colors. Jerry: Green clips/ College Applications, etc. i do that at work. I am dealing quite bit of paperwork. it helps to keep papers from mixing up. I do not label them on binders tho. I know by their appearances. 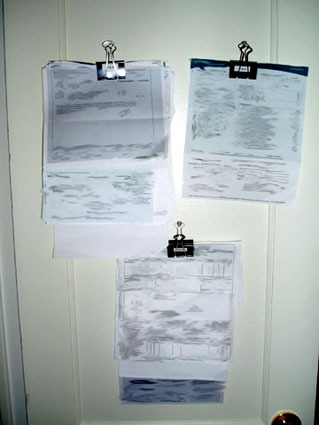 I do something similar, but instead of binder clips I used clipboards. I got them at Staples when they had them for 99 cents. They work great to keep things organized before you file them away, mail them, scan them, etc. This is brilliant! I’m going to start using this method immediately. I love binder clips. I used to use them to keep production schedules and hot action items organized next to my desk. Even though I now work at home, I still use them for all sorts of things. I love to use them to keep receipts together until I need to act on them. Genius!!! Even though I prefer to keep all papers hidden from prying eyes, this is probably more effective and will keep me more on schedule. I have long been a fan of binder clips and have even blogged about them in the past. They are so handy for so many things. I tend to like my active and pending papers out where I can see them, so I like the black binder clips because you can write directly on them with a silver Sharpie. I’m so glad people liked the idea!!! I use it at work too, for our lists of phone extensions and similar kinds of info) and have found it to be helpful. This is a neat idea. I like having things at eye level. I recently fell in love with binder clips when I was creating a mail sorting station. I put bins on a book shelf, but then couldn’t find our labelmaker. So, I wrote labels on index cards and used binder clips to clip them to the bins. As much as I love my labelmaker, these are staying because they are easy to read and easy to move if I change my mind about which bins I want to use or how I want to label them. I do this with recipes. I clip recipes (http://almostvegetarian.blogsp.....-they.html) for the week together and hang them off a cupboard door in my kitchen. It keeps me organized, I keeps me using up the items in my fridge so nothing spoils, and it keeps my recipes handy and clean when cooking. Pretty good for something that costs less than a dime. Love this – great idea! I hate paperwork, and I hate it taking up space on my desk… what a quick and easy way to get it up and out of the way. It gets better – use a small white sheet of paper (taped to the flat end) and the transparent tape that you can write on with a pencil, and you’ve got an erasable filing system that you can stack vertically. No silver sharpie necessary. This is a great article! My…desk is sadly cluttered…and my window sill…and on top of my drawers as well. This is SOOOO going into action this weekend. I was just telling my 21you step-daughter that I wish our kitchen table had a big hole in the middle with a trash can under it to catch all the crap that accumulates. She was ROFL….she said that “The Crab Shack” in Charleston, SC has tables like that! Now I don’t have to drive all the way to SC to steal a fishy smelling table!!! Thanks for a GREAT organizing idea…..this is one that I know we will use and, more importantly, STICK WITH!!! I love binder clips so much that I’ve even incorporated them into the decorative design in my home office. Wanting to find a simple window treatment that would match the black and neutral decor in my office, I used large binder clips to clip three black, textured placemats to the top of my wood blinds. I then removed the silver clip that allows you to open the binder clips. It looks great and was a very inexpensive solution. How did I miss this article? I’ve been using this system for years and had I known others were unaware of it’s awesomeness, I would have suggested it somewhere to others! What I really enjoy about this system is that you can hang/file several stacks of documents in a very small area. For example, I was working in a very small, uninspiring office for a few years and above the desk (which faced a CMU wall) were cheap wooden planks for shelving. I kept a row of push pins in the edge of the shelves about 1 – 2 inches apart. Then, when you place the clips with papers, you allow them to overlap but still allow for a snippet of information of the contents within the clip. I could keep 20 or more of those binder clips of information handy and at eye level for easy identification and retrieval. You can also implement the overlapping/snippet method in a vertical manner as well. You can keep the clips in line vertically or stagger them so that they all hang vertically but in a diagonal fashion….etc. Whatever fits your workspace pinup area or preference. I still use this system at home and work. It’s also incredibly cheap to implement, perfect for limited office budgets! Thanks for posting this great suggestion! Awesome, awesome, awesome….I just read this one last night and put it into action today. It seems that in our family of 2 kids and 2 adults we always have papers flying everywhere. Inevitably they end up clogging the kitchen table. This will be perfect. I hung up 4 binder clips with names today and instantly took care of some cluttered papers. thanks for the great idea. 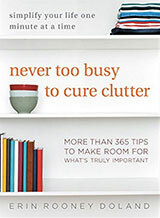 I read about this last night and put it into action today at work…I was so much more productive than usual! Thanks for the tip. Still one of my favorite simple ideas to use every day! If you don’t have a magnatic surface next to your desk, you could tape a magnetic key holder with some removable double stick mounting squares and use non magnetic binder clips. My father owned a bakery from the 1950’s through the 1990’s, and he used old-fashioned paper and binder clips for special orders. Each order was written on an order sheet (or scrap of paper), and he had a clip and hook for each day of the week. Each night he would go through the next day’s orders to plan production. It worked then; it still works!